Large Places of Assembly’ does not apply to premises that include sleeping accommodation, theatres and cinemas and or outdoor facilities. All that might be required in simple premises are a few signs that indicate the alternative exit or exits. However, more complex premises might require a series of signs that direct people along the escape routes towards the final exit. People that suffer from poor vision typically retain some of their sight and can recognise contrasting or changing colour, which can provide them with visual clues when moving around a building. (Estimates by The Royal National Institute of the Blind put the number of visually impaired people who are completely blind at just 4 per cent.) It could be enough to paint any walls and columns in a contrasting colour and highlight the changes in level by, for instance, making the nosing to stair and step treads a contrasting colour. People without sight can benefit a lot from the installation of more tactile aids, a sound localisation system to help people move towards an alert sound, or a properly managed system of continuous handrails. People typically attempt to leave premises using the same route they used to get in. Since the entrances in assembly places will be the preferred exits for many people it thus follows that other exits provided for the premises might not be utilised fully. It is due to this reason that all exits available need to be clearly labelled to help members of the public know that there are other ways to exit the building besides the doors they used to enter. The provision of properly sign posted exits in the full view of the audience helps provide a feeling of security in case of an emergency. Internally illuminated exit signs that are properly maintained will be needed where the lighting may be extinguished or dimmed such as in lecture rooms. Exit signs need to be clearly visible whenever the contractors, staff, and public are present. Having other signs such as promotional materials can obscure the visibility of or distract attention from escape signs. If the escape route to the closest exist isn’t obvious, a sign or signs should replace it. Escape signs should be mounted above the door in the direction of escape and not fixed to doors because they will no longer be visible if the door is opened. Signs should be positioned such that the person escaping always has the next escape route in his/her sight. All escape route signs should be accompanied by a directional arrow where necessary. The arrow must never be used on their own. Signs fixed above doors should be at between 2 and 2.5m above the floor. Signs fixed on walls should be mounted 1.7m to 2.0m above the floor. Escape signs should provide clear and unambiguous information to help people leave the building safely in case of an emergency. Signs should be ideally positioned at uniform height throughout the escape route so far as is reasonably practicable. Mounting heights of over 2.5m can be used for hanging signs, for instance, in large open spaces or for operational reasons, but care should be taken to make sure that those signs are conspicuous throughout the escape route to the extent that it is reasonably practicable. However, the most important thing is to ensure that the escape signs are always legible enough. 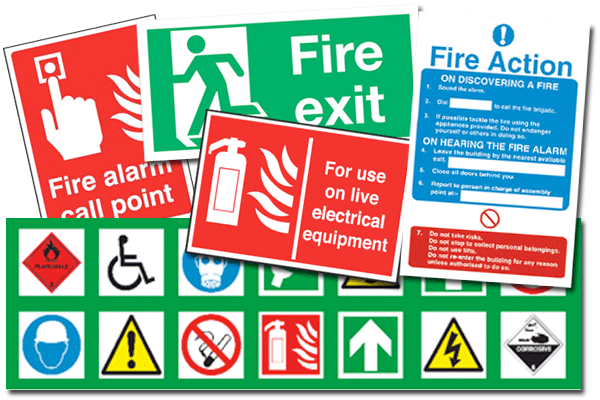 A sign must be pictographic if it is to be in compliance with the safety signs and signals regulations. 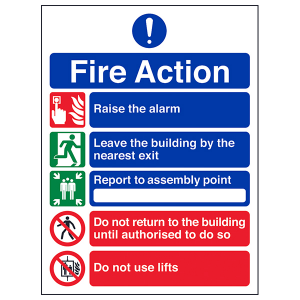 The pictogram may be supplemented by text if this is deemed necessary for making the sign better understood, but it is important not to have a fire safety sign that only uses text. Either sign type can be used but the different types shouldn’t be mixed. Appropriate signs need to take into account the needs of the people that may need to use them. Escape sign legibility generally depends on its size, the distance over which it is viewed, and the level of illumination. The signs used within the same premises should have a consistent design scheme or pattern. It is advisable not to rely on a handful of outsized signs that might encourage people to travel to a certain escape route when other more suitable routes should be used. The co-operation between the respective responsible individuals in multi-occupied premises should be sought to ensure that, whenever possible, all signs in the building conform to a particular scheme or pattern. Several other obligatory signs such as ‘Fire Action’ notice might also be required. Fire doors fitted with self-closing devices should have the label: ‘Fire Door: Keep Shut’ on both sides. Fire resisting doors to stores, cupboards, and service ducts that aren’t self-closing since they are routinely kept locked should have the label: ‘Fire Door: Keep Locked’ on the outside. Signs should indicate the fire safety equipment that isn’t automatic if there’s doubt about its location, such as fire extinguishers that are stored in recesses or cabinets. A notice labelled ‘Push Bar to Open’ should be displayed permanently immediately above the push-bar on all the doors that have a panic latch or panic bolt. 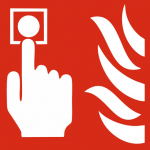 A notice labelled ‘Fire Escape Keep Clear’ should be displayed permanently at about eye level on the external face of the doors that have been selected to provide a means of escape in case of fire, which can become obstructed since they are not normally used. In simple premises where the number of escape routes might be limited, it can be reasonable to provide staff with verbal reminders of what to do in case of fire. 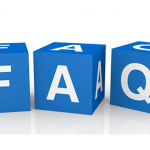 In some premises, you may consider having a brief written statement that may, for instance, be delivered with the staff pay slips every 6 months. In larger, multi-occupies, and more complex premises with high staff turnover, a more considered approach for staff instructions and notices will be required. Besides positioning the fire instructions notice on the escape routes adjacent to the fire break-glass call points, they should be placed in areas where staff assemble frequently in the premises such as the locker rooms and canteen. 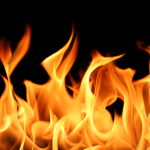 In other premises, such as nightclubs, it is important to consider if it would be suitable to provide fire instruction notices in public spaces or whether they only should be in areas that staff have access to. If the premises are routinely expected to accommodate people whose first language isn’t English you might have to consider offering instructions in multiple language. Ensure that the interpretation always conveys an identical message regardless of language. 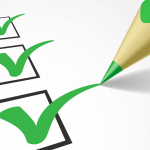 The supplier or any other competent person can provide further advice. 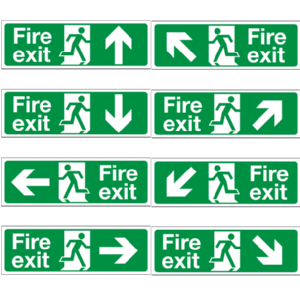 All the directional and exit signs that indicate the exits from any area in the premises where members of the public are allowed should be illuminated using regular lighting as well as emergency escape lighting whenever members of the public are on the premises unless they are already self-luminous fire safety signs. Photo-luminescent notices or signs i.e. where the active material that makes up the luminous part of those notices or signs require a period of exposure to light before they are visible in the dark, but get fainter as time passes by, aren’t a substitute for the prescribed emergency lighting and should only be used if the other forms of illumination are already present.